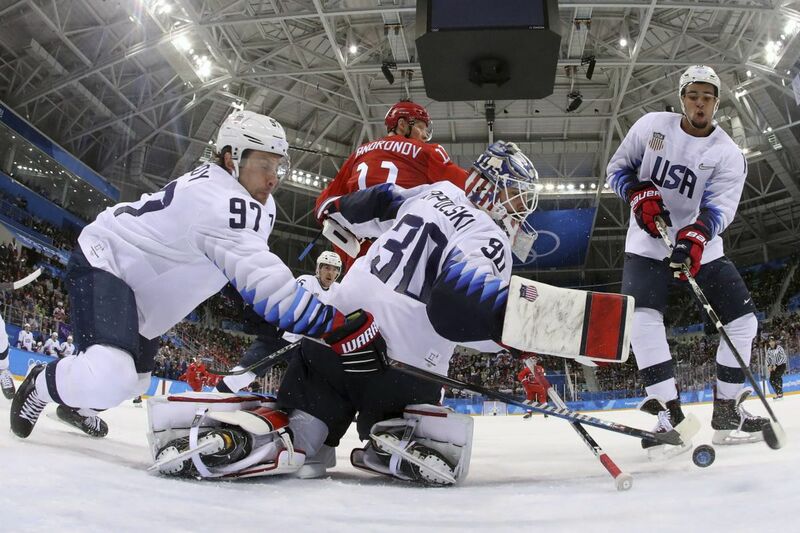 Matt Gilroy (97), goalie Ryan Zapolski (30) and Jordan Greenway (18), of the United States, reach for the puck during the first period of the preliminary round of the men’s hockey game against the team from Russia at the 2018 Winter Olympics in Gangneung, South Korea, Saturday, Feb. 17, 2018. GANGNEUNG, South Korea — Even with the absence of the NHL players from the Olympics this year, there was certainly no absence of fan excitement between the United States and the Olympic Athletes from Russia. With chants breaking out in the concession lines of Gangneung Hockey Centre before Saturday's game even began, the matchup between the storied rivals was reminiscent of the many historic games between the teams. Unlike in Sochi, it was the Russians who had the upper hand in the final preliminary-round game, defeating the U.S., 4-0, to take the top spot in Group B, which guaranteed them a bye to the quarterfinals. The U.S. will be forced to play in the qualification round on Tuesday. "I play in Russia on a regular basis and I haven't quite seen anything like that," U.S. forward Brian O'Neill said. "That's as good as it gets. Unfortunately, we didn't capitalize on our chances, but that's pretty darn good hockey." Nikolai Prokhorkin and delivered the perfect dish as Prokhorkin slipped the puck passed U.S. goalie Ryan Zapolski for a 1-0 Russia lead. Shortly after, defenseman Matt Gilroy saved the Americans from falling behind, 2-0, in the first as he stretched across the goal crease to corral the puck. While shots on goal in the first were relatively close, 13-11 in OAR's favor, a 19-15 margin in faceoff wins gave the Russians the edge. For the game, the U.S. outshot OAR, 29-26. U.S. head coach Tony Granato said he knew coming in how skilled the Russians are. "We knew they had a ton of talent," Granato said. "I thought we skated with them, I thought we battled for every inch of ice out there, and played as hard as we could." The teams combined for seven power plays in the second period. Fresh off killing a Russian power play early in the second, Prokhorkin notched his second goal, a wrister from the top of the circle at 2:14 into the period. Gionta had one the Americans' cleanest looks at the net all night on a breakaway in which he had the defender beat, but he fumbled the puck and lost control. "Just bounced up on me, bounced up over my stick," Gionta said. "I had him beat. Disappointing, for sure." A double power play that resulted in four-on-four hockey brought fans to their feet. An additional OAR penalty resulted in a brief four-on-three for the Americans, but they were unable to capitalize on the man advantage. The dagger came with 0.3 seconds left in the second when IIya Kovalchuk scored to put the Russians up, 3-0. Twenty-eight seconds into the final period, Kovalchuk struck again. Granato said the game didn't feel like the lopsided loss that the scoreboard showed. "The atmosphere was great. The energy in the building was great. I thought it was a great game," Granato said. "I don't think it was a 4-0 game, but that's what the scoreboard says. It was an NHL pace that's for sure." "It's national pride," Adam said. "You know, win or lose, we're coming out and having a good time. It's still about friendship and camaraderie and having a good time with each other."